Honorary Member A. James Clark, Hon.M.ASCE, NAE, who owned one of the country’s largest general contracting firms, Clark Enterprises, died March 20 at his home in Easton, Maryland. He was 87. Mr. Clark, born in Richmond, Va., was hired by the George Hyman Construction Company and was named its president in 1969. In 1996, he merged George Hyman with a subsidiary construction firm he owned (Omni Construction) into the Clark Construction Group. His companies built more than 1,200 projects in the Washington, D.C., metro area during his tenure and many more nationwide; among these are his most recognizable landmarks in Washington, the Dirksen Senate Office Building, Nationals Park, and the Verizon Center, as well as Milwaukee’s Miller Park and San Diego’s Petco Park. Clark was well known for his philanthropy and gave generously to universities, medical facilities, and other organizations that helped veterans, the homeless, and the disadvantaged. Clark served on a number of corporate boards, including the Samaritan Inns. 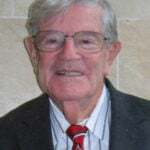 Clark earned a bachelor’s degree in civil engineering from the University of Maryland in 1950, and was the benefactor of the university’s A. James Clark School of Engineering in 1994. He also established a scholarship endowment fund to enrich the undergraduate engineering experience and to help solve the nation’s shortage of highly trained engineers. In addition, Clark was a trustee emeritus of Johns Hopkins University and the George Washington University (GW), where he endowed the Clark Scholars Program for GW’s School of Engineering and Applied Science. He was bestowed a Doctor of Engineering honorary degree from GW in 2010. In 2002, Clark was named an ASCE Honorary Member, and in 2006 he received ASCE’s OPAL Lifetime Achievement Award for Construction for innovation and excellence in construction of civil engineering projects and/or programs.